Aided by the first clear weather in three days, the Japanese attacked Dutch Harbor on the morning of June 3, 1942 almost simultaneously with their attack on Midway. The Naval Air Station had gone to General Quarters at 0430 Hours in accordance with daily routine. At 0545, while battle stations were still fully manned, a flight of about 15 A6M2 Zero-Sen fighters appeared and opened fire. After a single flight over the station, during which they did very little damage, the planes moved off to the northward. At about 0550 four B5N2 "Kate" bombers approached. Five minutes later they released 16 bombs. Two dropped into the water, but 14 fell in the congested area of Fort Mears. Two barracks and three Quonset huts were destroyed and several buildings were damaged by the hits and resulting fire. Approximately 25 men were killed and about the same number wounded. A second flight of three bombers overshot Fort Mears and did no material damage, but a third flight of three planes damaged the radio station and demolished a Quonset hut. The last flight of planes apparently had as its target the old wooden oil tanks. The bombs overshot the tanks, but killed two men. All told, about 15 fighters and 13 horizontal bombers participated in the raid. All the bombers were tracked in at about 9,000 feet. No fighters from Fort Glenn, 65 miles away, managed to intercept. The morning of June 4 was rainy and overcast. 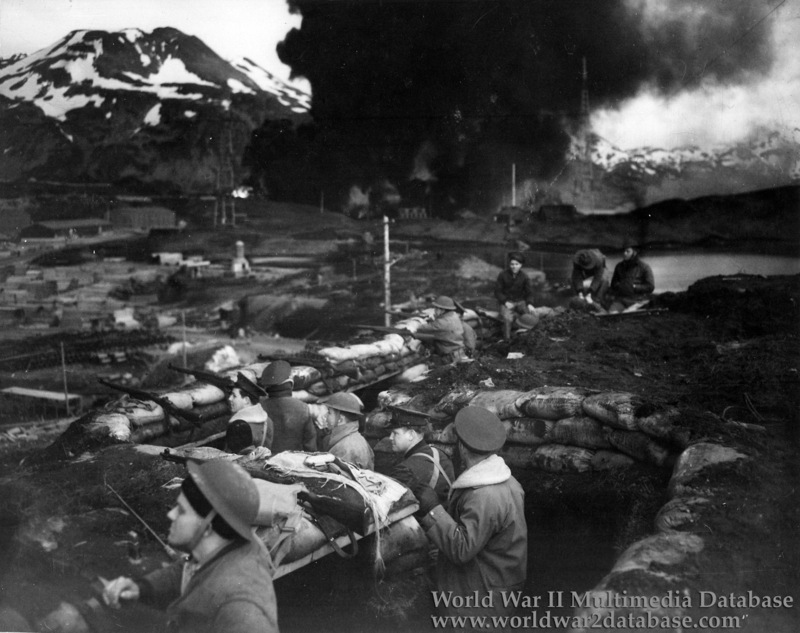 At 1740 Hours Fisherman's Point Army Observation Post reported three flights of bombers headed for Dutch Harbor. At 1800 fire was opened as ten fighters attacked the Naval Air Station in a low strafing attack. Then 11 D3A Aichi "Vals" delivered a dive-bombing attack. Each carried one large bomb, which was released after a shallow dive to 1,500 feet. The chief damage was to four new 6,666-barrel fuel oil tanks, which had been filled for the first time on June 1 by the oiler S. S. Brazos. The oil tanks were totally destroyed and can be seen burning behind the soldiers. The Japanese also scored hits on a warehouse and an empty aircraft hangar. At 1821 three B5N2 "Kates" approached from the northeast. Their five bombs fell harmlessly into the harbor. The final attack of the day came at 1825, when five planes, approaching at high altitude from the northwest, dropped bombs near the magazine area near the south slope of Mt. Ballyhoo. Nine bombs were ineffective, but the tenth killed an officer and three men in a Navy 20-mm. gun emplacement. American casualties during all the attacks were 33 Army, 8 Navy, 1 Marine Corps, and 1 civilian killed, plus about 50 wounded.